The Green Cleaning Award for Schools and Universities recognizes and honors schools with outstanding green cleaning programs. The application for the 2018 award is now available online. Applications are due on Jan. 16, 2018. Visit American School & University magazine’s website to download the application and get started. 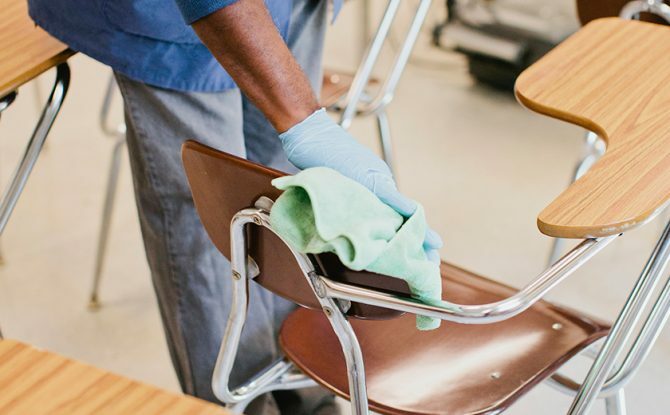 Presented by Healthy Schools Campaign, American School & University magazine and the Green Cleaning Network, the Green Cleaning Award for Schools and Universities is based on the 5 Steps to Green Cleaning in Schools. Winners are profiled in American School & University magazine and the Green Clean Schools blog. This is the only award in the country that honors and recognizes K-12 schools and colleges and universities for their green cleaning programs. It’s a valuable and unique opportunity to recognize your staff, communicate all that you’re doing for the health of your community and environment, and to take stock of your program and plan for the future. Through our participation in the Green Cleaning Award, we’ve been privileged to learn about many dedicated cleaning programs doing inspiring things for the health of their students, staff and communities. From small schools just starting out on the green cleaning journey to large universities applying for the third or fourth time, the applicants consistently teach us new lessons about green cleaning and the indoor school environment. Download the application today, and make sure to send it in before Jan. 16. We look forward to reading these applications and hope to hear from you!